For the first time in over a week, the South Easter subsided enough to walk on Fish Hoek beach this morning without my legs feeling like they'd been sandblasted. 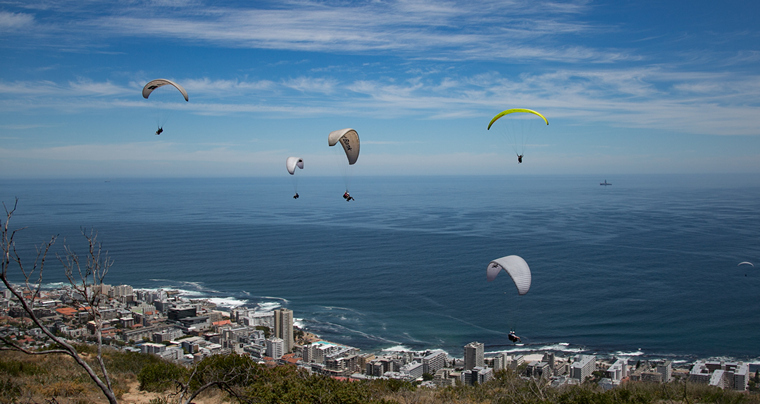 Such perfect conditions got me thinking about the Paragliders on Signal Hill, and the masses of holidaymakers who would be taking advantage of a day like today. I jumped on my trusty Triumph and rode through to town to get some images of the action. If I'd gone in my car, I'd still be trying to get up Kloof Neck Road which should be renamed "Clutch Lane" as the smell of clutch plates being 'ridden' stayed with me as I passed the queue of bumper-to-bumper cars stretching all the way from the bottom to Table Mountain Road, which Metro had closed due to the volume of traffic. 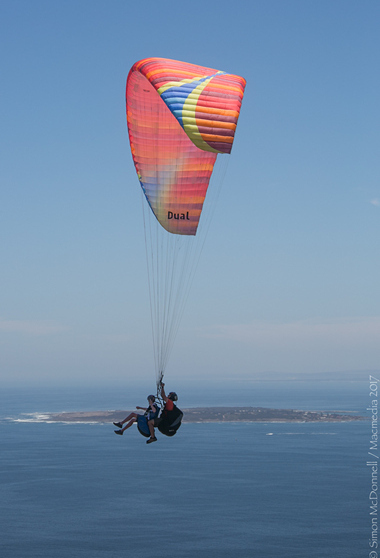 Signal Hill was fairly quiet by comparison, but that didn't mean that the 25 or so Paraglider Pilots weren't busy. 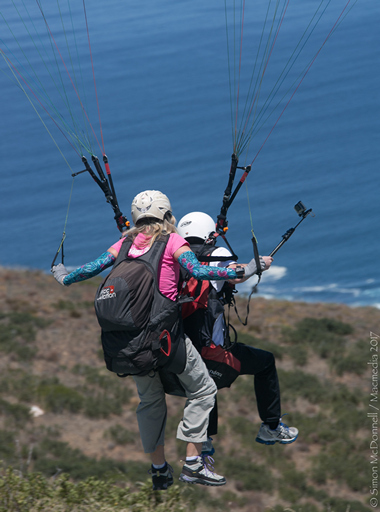 I met Sue from Cape Town Tandem Paragliding who is the 'Meet and Greet' lady at the launch site. Sue told me that there were between 20 and 30 Pilots on the mountain today, and that they were fully booked. 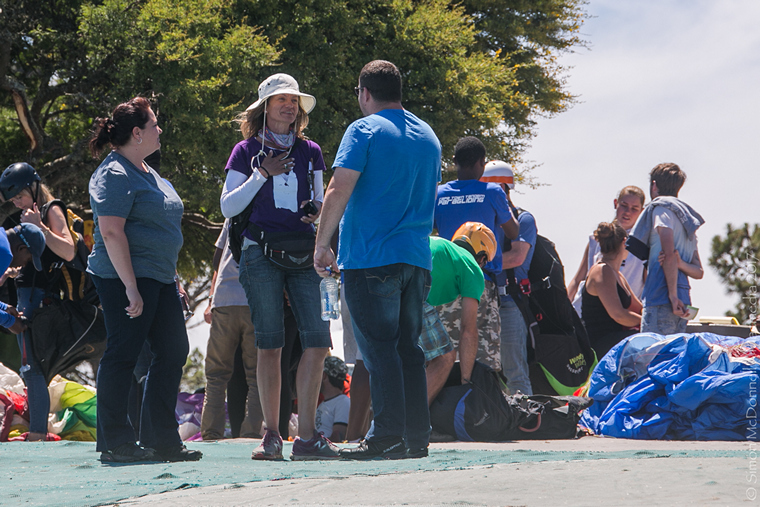 Sue, Cape Town Tandem Paragliding's, "Meet and Greet' person chatting to passengers. 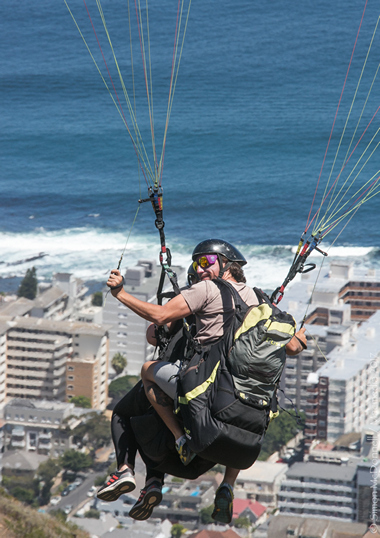 Each flight has a duration of 10-15 minutes, landing in Sea Point which means about an hour turnaround time for a pilot and canopy. 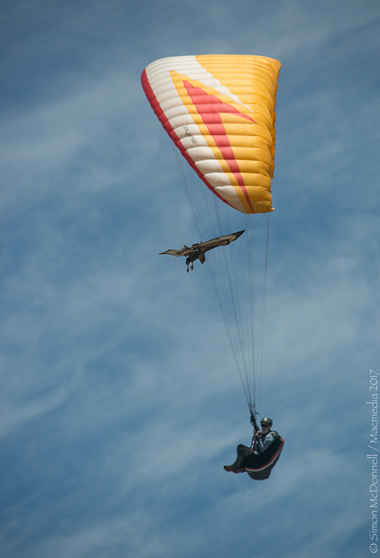 Each pilot was doing 7- 8 flights today, so the launch area was pretty busy, with a number of Paragliding companies running their operations from the shade of the nearby trees. 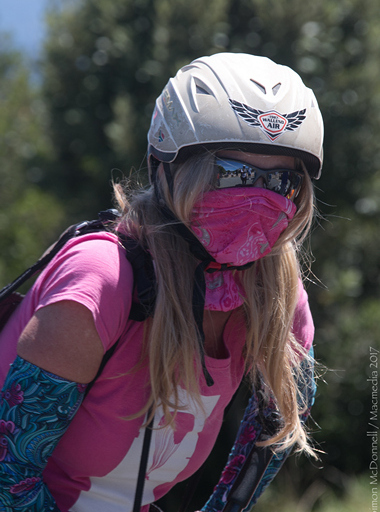 Carolina, the only female pilot on the mountain. 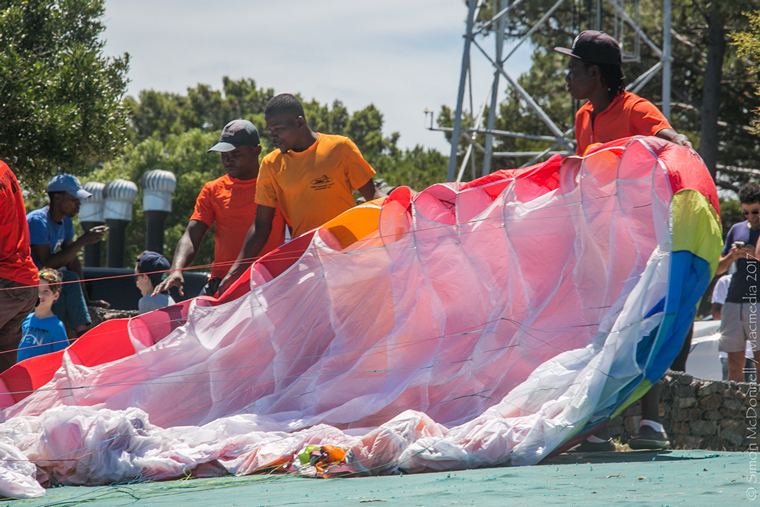 Launches appeared to be well organized and safety checks were performed rigorously by the pilots before they took to the skies with their excited and animated passengers. I heard more than one scream of exhilaration! 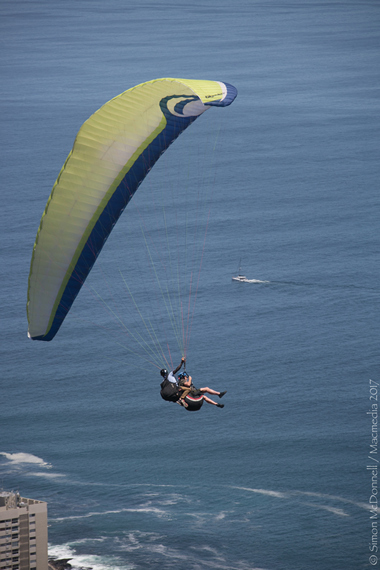 Paragliders are permitted to fly during sunlight hours, weather permitting. Passengers must be between 20 and 120kg's. 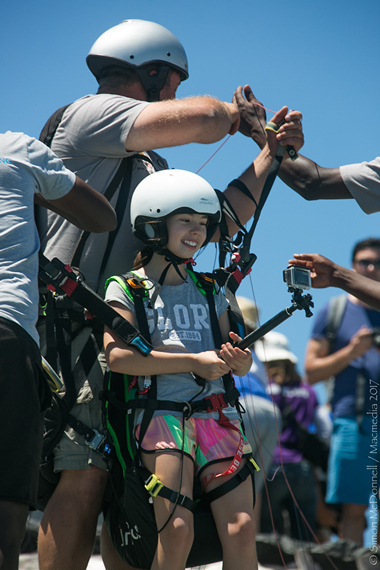 Mike, who has been an assistant on the launch ramp for 15 years, told me that the youngest passenger they'd flown was 3, and the oldest was 89! 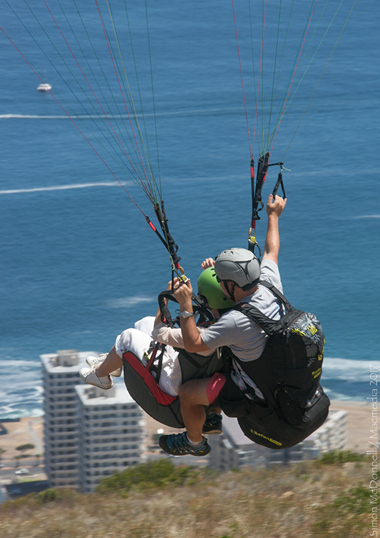 If you're an adrenaline junkie looking for a rush whilst in Cape Town, this could be just what the doctor ordered! A Birds eye view of Robben Island.... Where 'Soaring with Eagles' is a reality.